CALGARY (July 8, 2016) — Just a few days after the Academy of Motion Pictures Arts and Sciences extended a membership invitation to Abbas Kiarostami, the Iranian director died of gastrointestinal cancer at the age of 76 on July 4th. The death of the acclaimed Master Director is a major loss to the international film world. 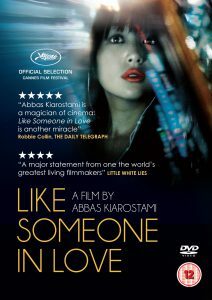 The 2012 production “Like Someone In Love” is Kiarostami’s last feature film. It remains a legacy of Kiarostami’s artistic endeavor that crosses national boundaries and cultures. Following his Italian set “Certified Copy” two years earlier, “Like Someone in Love” was the second film the director made outside Iran. The French-Japanese co-production was a nominee for the Palme d’Or at Cannes Film Festival that year, a prize Kiarostami won with “A Taste of Cherry” in 1997. In this world of ever growing unrests and conflicts, Kiarostami left us with an exemplar of international collaboration beyond race and language. The Iranian director wrote the script of “Like Someone in Love” and directed Japanese actors, situating them in the context of their own urban society, crafting a fusion of cinematic aesthetics that is both East and West, while exploring themes that are universal. Akiko (Rin Takanashi) is a university student who moonlights as a call girl at night, a secret she has kept from her emotionally volatile fiancé Noriaki (Ryô Kase). One night, she gets an assignment from her boss Hiroshi (Denden) to go to a retired sociology professor’s home outside of the city. Reluctantly, she steps in a taxi flagged down by Hiroshi. We see Akiko through the taxi’s window which reflects the urban night life of vibrancy with neon colors. Inside, Akiko’s face is filled with sadness and conflicting emotions. She is forfeiting a chance to meet her grandmother who has come out to the city just for the day to hopefully meet with her. As she asks the taxi driver to go around the station Akiko sees her through the window, an elderly woman with a luggage by her side, looking around for her granddaughter to show up. As the taxi drives around and around, tears stream down Akiko’s face. A poignant scene. Upon arrival at the home of professor Takashi Watanabe (Tadashi Okuno) an hour later, Akiko is a different person. Business is business. Interestingly, she finds the professor’s home fascinating. The set design is elegant and classy as we see shelves of books and arts line the walls. Like the centerpiece painting, “Training a Parrot” (1900) by the Japanese artist Chiyoji Yazaki, who introduced western style oil painting to Japan, the film is a fusion of East-West aesthetics. Kiarostami, who studied art and painting before becoming a filmmaker, knew his subject and used his expertise admirably. A few lines of dialogues bring the two characters into amiable relationship. Akiko soon finds the professor is not so much interested in getting into bed with her than just having a companion to share a homemade dinner, fine wine and soft music. The ambiance sound in the background plays an important role in the film, reminiscence of the work by French director Robert Bresson. After Akiko flirtingly gets into bed without her client, she soon falls asleep. The professor quietly goes to her bedside to unplug a ringing phone and turns off the light, as soft jazz music plays in the living room. He then walks back out to take the call and is shrouded by the warm embrace of Ella Fitzgerald’s “Like Someone In Love”. Has Akiko stirred up in him a long-lost passion, or maybe reactivated a father-daughter bond? The next day the professor drives Akiko to the university to take her exam. As he waits for her in his car, fiancé Noriaki steps in and introduces himself, mistakenly taking Watanabe as Akiko’s grandfather. Playing along, the professor finds himself taking up the role of a pre-marital counselor to the insecure and controlling boyfriend, dissuading him to marry Akiko. We see Kiarostami use the Ozu style of static, still camera to follow their talk in real time. Thanks to such long takes and slow revealing, we come to know the characters better. Noriaki seems to be appreciative of the elder’s words of wisdom, albeit quite firm in his decision to marry Akiko. In the film, we often see the characters through glass and windows, or their reflection on mirrors, an apt metaphor for how they see each other and themselves; through a glass obscurely, that is their perspectives, especially their views on this elusive entity called ‘love’. Akiko is still searching for it while her fiancé Noriaki thinks he has it but actually just a gripping desire for control, a violent hold of a possession. Professor Watanabe has a lifetime of experiences and academic excellence, but at this point looks like he is reaching out for someone to fill a vacuum, to replace a loss. The seemingly amusing interplay between the three characters comes to the final scene wherein Kiarostami skillfully released Hitchockian suspense and tension, building to a surprise ending. Not one to resolve neatly, Kiarostami left us to ponder and interpret. The baffling ending could be a teaser of role-reversal the director had played, giving the viewer the task of determining the future of the characters, like someone writing the script. Contact Diana Cheng on Twitter @Arti_Ripples or through her blog Ripple Effects, rippleeffects.wordpress.com.